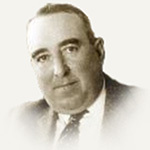 Joseph W. Young, Jr., was acknowledged as one of the five or six major city builders in boomtime Florida. 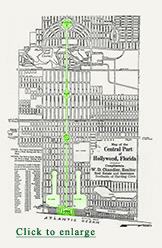 From practically nothing in 1920 he created Hollywood By-the-Sea with an elegant Beaux Arts plan of circles and lakes, calling it a "City Beautiful," an ideal first propounded by Daniel Burnham of Chicago. Young had a rare talent for publicity and a knack for making and spending millions--supported by an immense personal charm that is still remembered decades after his death. 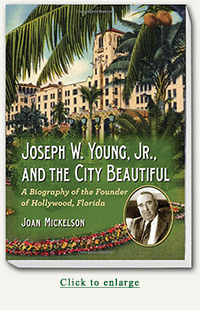 The book cover is from a postcard of the Hollywood Beach Hotel and Gardens, Hollywood Beach, FL; courtesy of the Hollywood Historical Society's collection.